Exploring possibilities for Maui as an ideal bamboo plantation growing select species for sustainable timber substitutes. The overarching goal of the The Bamboo Alternative project is the establishment of bamboo as a viable component in sustainable diversified agriculture, capable of producing building materials and food, while providing erosion control, windbreaks, and carbon sequestration. 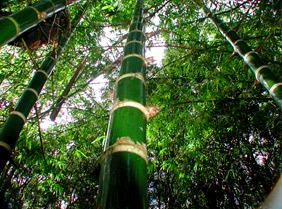 Maui's tropical rain forests are superb growing conditions for hardly constructions bamboos such as this Guadua, originally from Indonesia. Essential to this is the need to bring rigorous scientific methodology to the process of design, prototype development, testing and to the subsequent evaluation of bamboo as a sustainable architectural alternative. Research and testing must also include cultivation methods and preservation systems since tropical architecture is particularly vulnerable to insect predation and moisture related damage. These investigations anticipate the development and documentation of recommendations for the design and construction of a viable alternative bamboo architecture. By performing the scientific testing required for the local approvals by domestic construction authorities CHF can assist in the creation of a globally applicable information base capable of supporting similar initiatives of the citizens of developing countries. In cooperation with the University of Hawaii College of Engineering, the ICBO , Dr. Jules Janssen of Eindhoven University (Netherlands) and other internationally recognized scientists we sought to develop and perform physical tests of alternative construction systems for inclusion in local and international building codes. Presently in Hawaii only relatively modest stands of mature, elite timber bamboos exist, for which the typical propagation methods of cuttings, air layering or thinnings can only support a very small growth of the industry. While importation of plants is technically feasible, a lengthy and vulnerable quarantine period together with the reliance upon foreign gene pools does not represent a viable or appropriate long term alternative. Optionally, locally available small plants are not only prohibitively expensive but unavailable in large quantities. Tissue culture propagation of bamboo allows local laboratories to produce large quantities of exemplary specimens to start a small bamboo plantation. 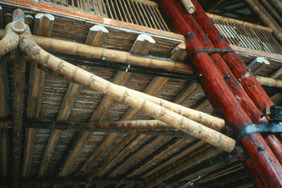 Ancient joinery techniques developed centuries ago in Japan still apply to strong durable bamboo buildings today. Though tissue culture is being successfully practiced elsewhere in the world, Hawaii has as yet has no established protocol. In 1998 when we de-mobilized the 150 acre Desert Hot Springs spirulina farm, Christopher Hills Foundation donated its machinery and laboratory equipment to Prof. Dulal Borthakur head of the University of Hawaii Department of Molecular Biosciences & Biosystems Engineering. CHF envisions working with this department to develop tissue culture propagation protocols for the promising timber species now growing in Hawaii. We often hear about people stuck on the bottom rung of the economic ladder. 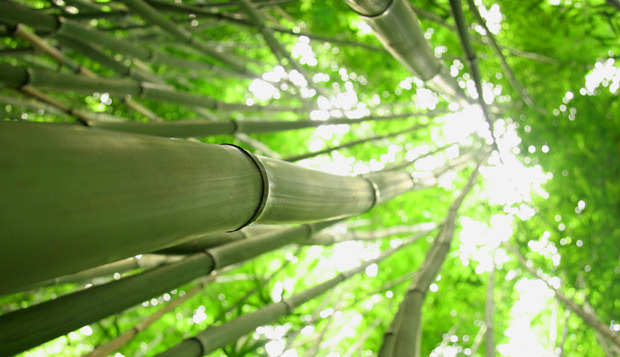 The proposed film explores vast opportunities presented by the sustainable cultivation of bamboo. The theme is that disadvantaged communities in countries where bamboo thrives can produce a valuable export that will enable their families to climb the ladder of economic opportunity. The documentary will be based on the past efforts of the Maui-based Christopher Hills Foundation Bamboo Alternative project and its research into bamboo cultivation and construction. It will can circulated in DVD and on-line streaming as a fundraising tool as well as offered for broadcast as an entertaining and educational insight into the fascinating world of bamboo. The goal is to convince consumers, governments and industries dependent on declining resources of traditional hardwoods building methods, that bamboo offers a lucrative alternative to chopping down old growth forests. The documentary film will explore bamboo\’s role in housing construction, interior design and traditional cultures and feature success stories of bamboo cultivation and construction. transportation and reduce dependency on foreign oil. Christopher Hills Foundation Expedition to Palau and Micronesia researched stream ecology, traditional aquaculture and native woods conservation through artisans. Evolution of the brain as an instrument of perception. Practical and spiritual answers to the world's social, economic and political problems. The Phoenix symbolizes rising new consciousness within each person on the planet. An evolutionary change in consciousness with each enfolding chapter. Answers to questions scientists, philosophers and laymen have asked of the universe over many ages. Explaining the influence of color and light and an exploration of past frontiers of knowledge into the hidden universe of our personal energy systems. Find lasting abundance and security. The reasons for America's financial problems and other countries' downfalls, throughout history. How can we avoid duplicating the fall of the Roman Empire? This book outlines the answers to the future both economically and spiritually. The vision of two men harvesting the sun's light in edible algae from 1962 onwards. Christopher Hills Foundation’s practical research technologies on feeding the hungry and making biofuels. A Pioneer's Story in Aquaculture. His mission with Christopher Hills bringing this superfood to the world. 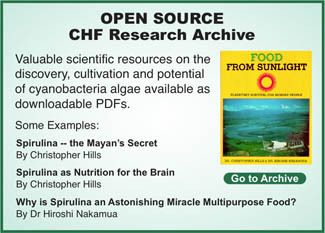 The exciting history of Spirulina; a food from ancient times. Its incredible properties suggest that it could well be the "manna" referred to in the Bible. 30 years ahead of Google Glass’ current telekinetic biosensors research with Stephen Hawing.